This trip was absolutely amazing. I am so happy I went on it and know I will remember it for the rest of my life (or at least until I get Alzheimer’s disease haha). I think the big thing I took away from this trip, other than the academic stuff, was that I know now that I would never want to live in Japan long term. I would be very sad if I never made it back to Japan in my lifetime, as it is truly a wonderful place and there is so much I still need to see. 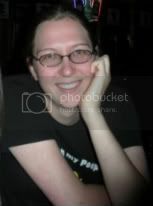 But the culture is so different there that I don’t think I could live there for more than a few months. There are the obvious reasons, like I don’t know the language, but there are some other reasons that are not so obvious. I love Japanese food, but I missed American food so much while I was there (my first meal back in the States was buffalo chicken, mashed potatoes, and garlic bread), and I’m not sure how I would deal with having to pay an arm and a leg for everything. Plus Japan is a warmer climate, which I could deal with, but when you’re go-go-go all the time, you sweat all the time which is annoying. Also, I’m not sure I could deal with working in Japan. The work atmosphere is so different over there that I would have to wholeheartedly love my job to even consider having that sort of work ethic. They expect your work to come before your family, which I don’t think I could do. And the hours they work are crazy! So I shall leave Japan on my list of places I want to return to and keep it off my list of places I would be willing to live in. Thanks Dr. C for taking us on this amazing trip! I’ve never been a huge fan of baseball, though I don’t mind going to games. 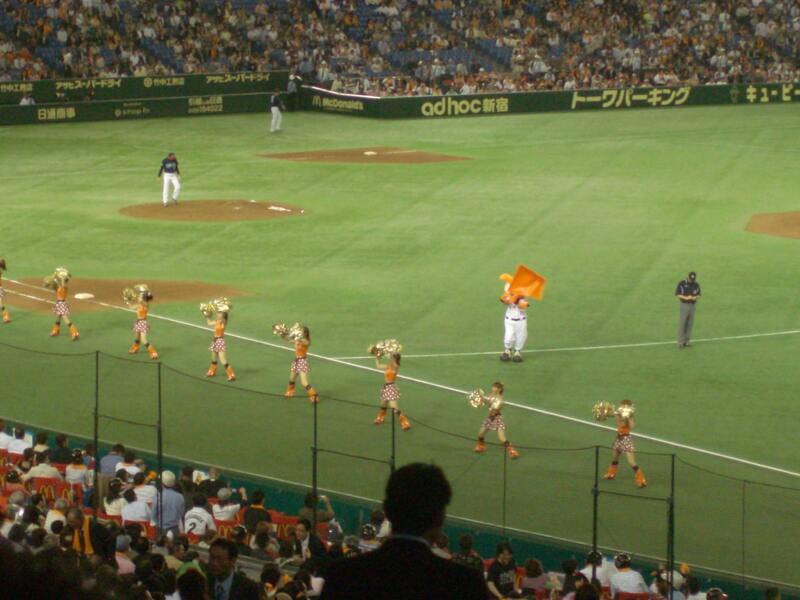 Baseball games in Japan are crazy compared to ones in the US. The fans have set cheers they will do and there’s a place on the scoreboard that lets the stadium know which cheer will be next. They can unfurl a flag that covers about 15 rows or so in a matter of half a minute, wave it around for the duration of the cheer, and then it will be gone by the time you’ve blinked. If someone scores a hit, the stadium goes wild. If someone scores a run, the stadium goes wild for 5 minutes straight. And they are so courteous to the other team. When it’s the visitor’s turn up to bat, the home fans will allow the visiting fans to do their cheers without trying to overpower them or anything like that (something American fans love to do). But if the home team makes an incredible out, once again the stadium goes wild. Overall, it was a lot of fun, even though I have no idea who the opposing team was other than “B”. Coming from a country where religion is rather big, especially Christianity, it’s noticeably different, once you think about it, coming to a country like Japan, where religion isn’t a big part of society. Buddhism is definitely the most prominent religion in Japan, though I think it’s more a philosophy than a religion. In all the times walking around the cities, I don’t really remember seeing any churches and definitely didn’t see any Jewish temples or Islamic mosques, though at the same point, maybe I wasn’t looking. This made it hard sometimes on our two Muslim students as they tried to explain that they couldn’t have any pork whatsoever (the Japanese-English barrier didn’t help). It’s amazing how different the Shinto shrines and Buddhist temples were from churches and cathedrals. They are meant to be both historical places and places for prayer, so it was common to see locals praying while tourists were milling around. I feel like that wouldn’t really happen in the cathedrals of Europe, though I must confess that even though I’ve been to some of them, I was of an age where things like that didn’t matter to me. There’s a different mentality over there and I didn’t really notice it until I was thinking about religion and how it’s treated differently there. I just read the delightful tech review on Japanese toilets by fellow study abroad participant Joanna Darby and thought I’d mention them on my own blog, because really they are quite interesting. The traditional Japanese toilet is not much more than a hole in the ground with a lever to flush with. You have to squat in order to even use it, which can be interesting for the first time user. But the really neat stuff comes with the Western style toilets. I never knew a toilet in such everyday places as the subway, a restaurant, or a hotel room could have so much technology. The one thing that made a regular appearance was a button to activate the sounds of flushing, and in some cases other options, so that one can do their business with a little more privacy. Other amenities we came across were a button to activate a spray or bidet for one’s backside and a heated toilet seat. I don’t know if any of these things will catch on in the rest of the world, but props to the Japanese for thinking of it first. One huge difference between Japanese and Americans is the type of games we like to play. Americans love action games where we get to do crazy stuff and blow stuff up. The Japanese are much less inclined towards that high-thrill sort of game. They like the role-playing games and simulation games where it’s way more about the story than anything else. I doubt a game like Dream C Club, which we saw at D3 Publisher, would be very popular in America because it is basically “a Japanese hostess game where the player gets drunk with the hostess while trying to gain her favor” (courtesy of Wikipedia). Something I noticed while in Japan is that they eat a lot of pork. I expected it at the Korean barbeque and shabu shabu because they tend to offer multiple meats at those sorts of things. But in the convenience stores, the only non-breaded meat sandwich they had were ham sandwiches. I did not see one turkey or roast beef sandwich the entire time, both of which are fairly common in America. 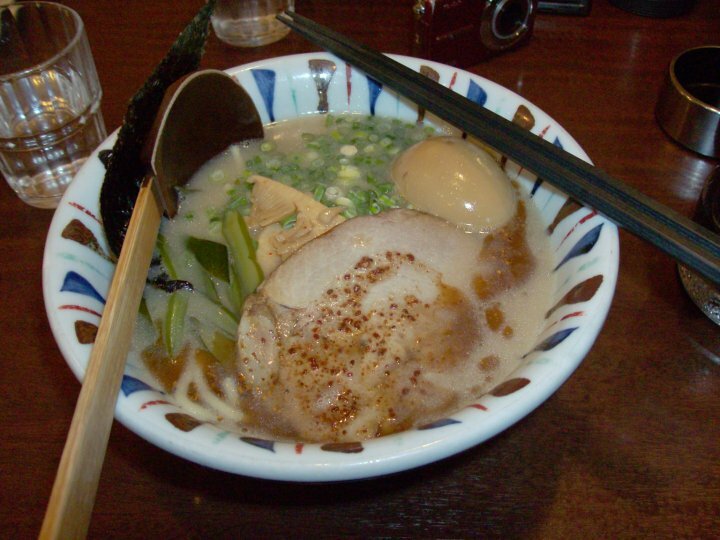 One ramen shop I went to only seemed to offer ramen in a pork-based broth. One meal I had was a couple of balls of rice wrapped in cooked pork and the okonomiyaki (not really a pancake, but that’s the easiest way to describe its general look) was topped with slices of bacon. Ton katsu (breaded pork cutlet) is much more popular than its chicken or beef version. It surprises me that pork is so popular in Japan because it’s not nearly as popular in America. I didn’t mind it though because I love pork! One thing that I’ve really liked about Japan is the idea of cooking and sharing a meal together. We had two group dinners, Korean barbeque and shabu shabu, where we would cook the food ourselves in small groups. I had done both the last time I was in Japan as well, so I knew what to expect. It’s a lot better than cooking at home because the food was cut up and ready to be cooked, so we literally just had to cook it. It’s great because we basically just threw a bunch of stuff on the grill (BBQ) or in the pot (shabu shabu) and grabbed what we wanted as it was done cooking. The Japanese often will slice their meat very thin so it cooks very quickly, which was nice for these dinners because we only had to wait about a minute for our food to be done. Everyone seemed to have a lot of fun with it and I would definitely do it again! I love candy. Candy is one of the most amazing things on Earth, I think anyway. There are so many different flavors and textures, all of which have some form of sugar in them. 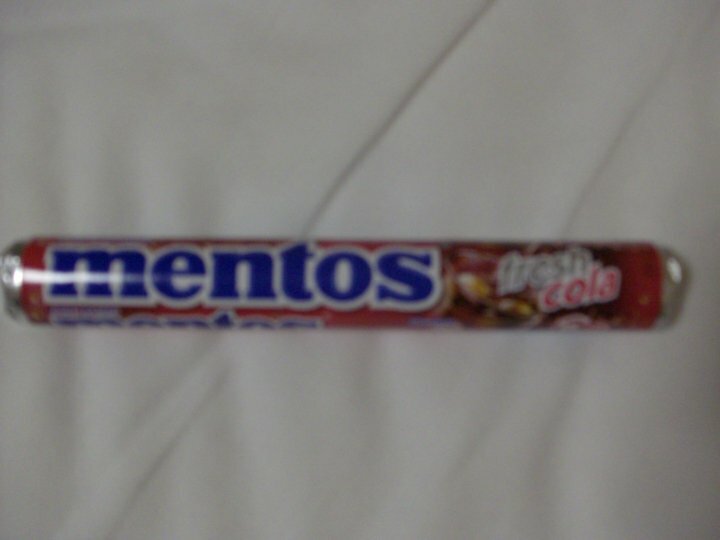 One of my favorite parts of traveling outside the US is getting to try out the different candies. So of course, it only took about a day for me to enter a convenience store and peruse their candy aisle. One of the things I love about Japanese candy is that it’s so true to the flavor it is trying to represent. Melon candies are one of my favorite Japanese candies for two reasons: it’s not a flavor we really see in US and it tastes just like I’m eating a piece of melon. I’m also a big fan of Japanese chocolates. They aren’t significantly different from American chocolate, but the Japanese have a fondness for pairing chocolate with either graham cracker or wafer crisp. This is wonderful for someone who really likes Kit Kats, such as me. Before leaving the country I even picked up a green tea Kit Kat, but I have yet to try it. I don’t really like green tea, so we’ll see how that goes! 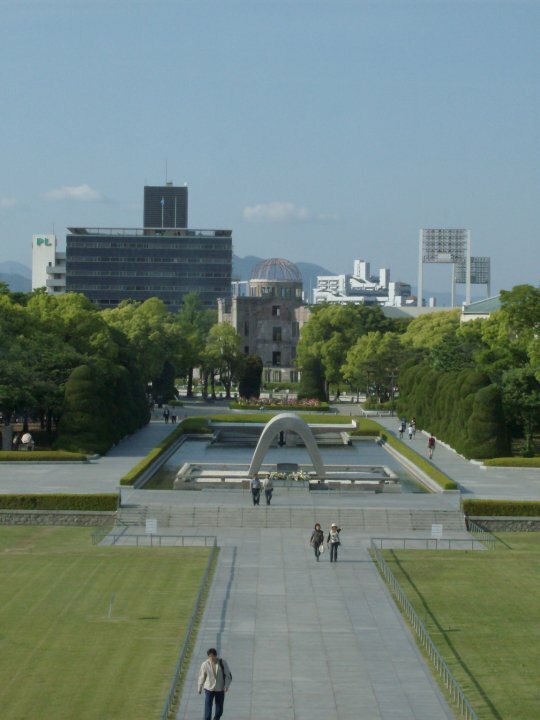 When I went to Japan about 9 years ago with my uncle and his family, we spent a few days in Hiroshima and went to see the Peace Museum and memorial dedicated in memory of those lost when the US dropped the atom bomb in WWII. I went back again for this study abroad trip which I think was good for me because I’ve grown up a lot since the last time I was there. I couldn’t remember a whole lot from my first trip to the museum, just bits and pieces of the exhibits and random facts I had learned. I think I took more away from it this time because I have a better sense of the magnitude of an event like that and I have a better understanding of the world around me. Walking through it again, I really felt a sense of calm along with the sadness. It amazes me that the US and Japan have such good relations now when this catastrophe happened only 55 years ago. I really hope those sort of weapons will never be used again.